I am going on my 10th year of consulting now, and as I progress in my career, I’m becoming increasingly aware that it’s not just technical proficiency that makes me successful at what I do. I can only execute a project on a technical level when a client has given me the okay to move ahead with the project. Being an effective consultant means I can get buy-in from my client, that the plan of action I’m proposing is the best way to accomplish their goal. I can best do that when my client trusts me and therefore my decision. That is the basic premise of The Trusted Advisor by David H. Maister, Charles H. Green, and Robert M. Galford. 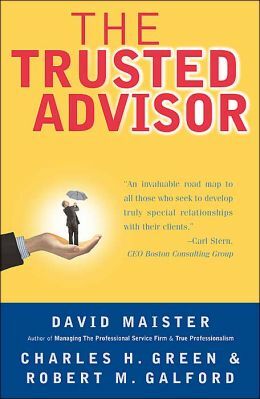 A “trusted advisor” is a person who has earned the trust of their client in such a way that the client will depend on them for expertise and decision-making in a uniquely personal way. A client most often develops this level of trust when the consultant has proven that they are willing to put the needs of the client above that of their own. Often times, in a technical field such as mine, where a person invests enormous amounts of time in learning the latest technology in order to be an “expert”, I find it’s often hard for a person to put aside their own ego long enough to actually listen to another person articulate their own needs. If there’s one theme the book emphasizes over and over again, it’s the need to put aside one’s own agenda as a technical advisor, to really listen, actively, to the stakeholder. This concept seems especially import when it comes to a product such as SharePoint. I’ve often told clients that if a manager from the top dictates “you must now use Outlook for your e-mail”, then if folks in the company want to check their e-mail, they don’t have a choice. However, a tool like SharePoint depends on many folks within an organization all deciding at once that using the tool to collaborate and publish content is more efficient and easier to use than their old means. If the SharePoint environment hasn’t been designed in such a way that people are compelled to start using it, they will continue to do things the same way they have in the past, and ignore the new SharePoint environment. In light of this, a consultant or IT professional could easily implement a solution that’s technically sound, but utterly misses the mark, if they have not designed the system based on feedback from the business owner and users involved. For anyone who wants a good refresher on what it takes to become a trusted advisor, I highly recommend this modern classic.